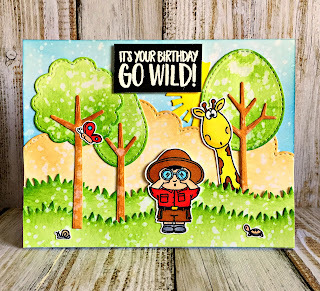 I'm Diana from Moments of Creativity and I'm back with another card featuring a very cute and recently released Go Wild Clear Stamp Set which is perfect for any adventure scenes with cute animals and a ranger. To create this card I went with a multi-layered landscape: hills фе the back, green long trees (I guess for the animals to better hide from people ), warm sun and grass. All these elements were made of the white cardstock and colored with Distress Inks and Copic markers. Well, to tell you the truth, this card is just a beginning of our little ranger's acquaintance with the creatures that live at the safari park. Next time you'll be able to see the story's development Stay tuned!